It is very important to take care of your pearls to ensure they remain bright and beautiful for generations to come. Cosmetics, sun block, perfume and hair spray all contain chemicals that can dramatically dull the luster of a pearl. The natural acids contained in body oils and perspiration can also damage pearls in the same way. 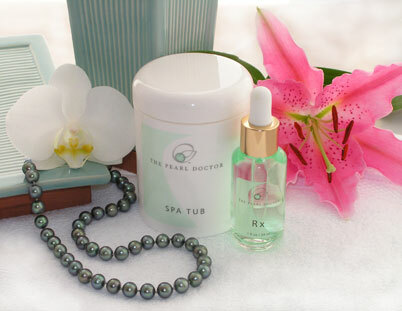 It is best to put your pearls on at least 30 minutes after applying any personal care products. How to protect your pearls? Wiping the pearls with a soft cloth after you wear them will ensure that they remain free of harmful build-up of this compounds. Always keep your pearls separated from hard jewelry items to prevent them from being scratched. Pearls are best kept in a soft cloth pouch or a soft lined jewelry box. Never store your pearls in an airtight environment such a a zip lock bag. Pearls are organic and do contain trace amounts of water. Storing them in an airtight environment will cause them to become brittle and damage the luster. If you wear your pearls often, they should be restrung about once a year to prevent strand breakage. Experts suggest the use of silk thread however, nylon thread is an acceptable alternative. The thread should be knotted between each pearl to prevent all the pearls in a strand from falling off should a break occur. Knotting also prevents possible damage from the pearls rubbing against each other.